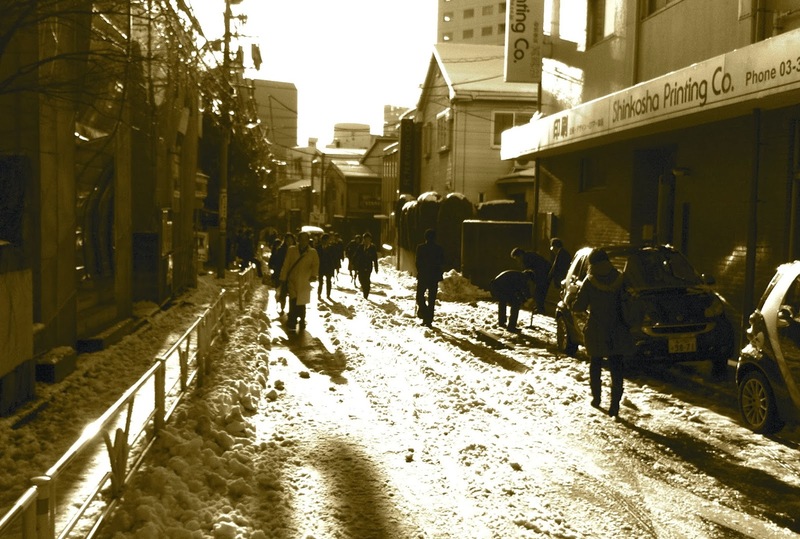 TenguLife: The curious guide to Japan: A dilemma in the snow. Was this the right solution? A dilemma in the snow. Was this the right solution? The snow has already started falling in northern Japan and over the next few weeks will begin to spread south. The Japan alps are looking spectacular and the ski slopes are already open for business. Last January heavy snow fell on Tokyo as well, something of a rarity. Walking to the station in the morning I saw a group of teachers clearing snow from in front of the local school. None of the work was really making a difference, the sidewalks were already clear as was the main entrance. The point though was not to clear snow but, as a team, to be seen to be clearing snow and therefore contributing to the local community. One of them, a female teacher in high heels and business suit, was using one of only two spades and clearly suffering for her efforts. This created for me a very Japanese dilemma. Should I offer to take the spade and help clear the snow or simply walk on? In my home country I may well have offered to take the spade, but this isn't my home country and the objective wasn't necessarily to clear snow. If I had offered to help and taken the spade the teacher would simply have continued, as many of her other colleagues were already doing, using her bare hands. I would actually have made the situation worse. She was there to be part of the team and would continue until the team itself finished. The group is always more important than the individual in Japan. So I gave her my gloves and asked her to leave them on the wall when she'd finished. At least she'd have warm hands.